Following information is from the T.O.M.C.A.T.s PDF. unless he went to college and made something of himself, he would be cut out of his father’s will entirely. Chicago since the day he graduated from high school. years before becoming unwittingly embroiled in a hostage crisis precipitated by North Korean supervillian, Gamagol. He was able to successfully negotiate a hostage release, plus feed the villain false information that led to his capture. 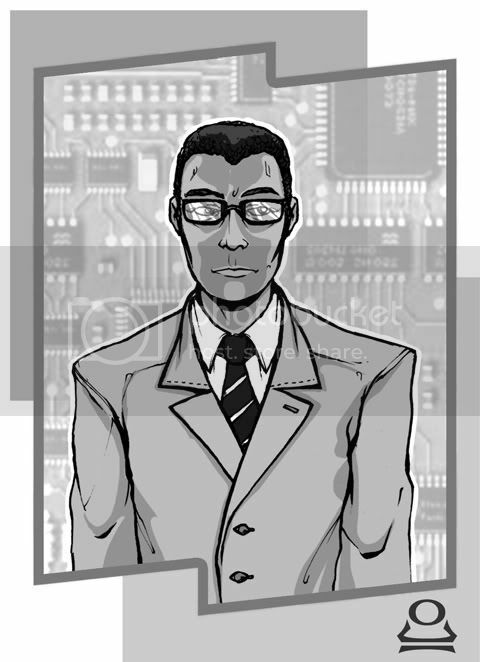 Milliford’s ability to keep a cool head on his shoulders was noticed by the right people, and he was picked to be the project manager for T.O.M.C.A.T.s shortly thereafter. Personality: Milliford is ambitious. He feels stifled by the rules and regulations he’s mastered, but he also knows that he can use these rules to his advantage. He has a core of greed in him that he keeps hidden; he certainly enjoys the finer things in life. Everyone knows this, but few suspect the lengths he’ll go to maintain that lifestyle. stunningly beautiful, though modest, woman. this treasured item, she generally wears drab, beige-colored, loose-fitting robes. punishment for some prior offense. Khatib, a rare female operative, is an expert at mind control; Fitnah’s unique ability is to charge living matter with explosive energy. Combining these two powers, the squad has systematically taken control of unwitting citizens and created a series of living, breathing bombs. Khatib mind controls the "victim/bomb" which Fitnah then charges with explosive energy. Khatib then has the "victim/bomb" walk into the target location and .... BOOM!! Temporal Augmented Rapid Deployment Incident Suit. 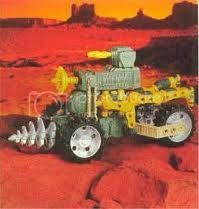 Motivation: Thrills: Being a hero gives Carter a feeling of "being alive"
prototyping and developing new technologies. Secret: His "biological" father was an alien visitor. Here is a variant of the Paladin Armor system. The next evolution... The story arc that we are playing through is leading the heroes into a clash with the main bad guy and in the "final confrontation" there will be some revelations. The Paladin character has been living a secret life. I opted to take a character concept that I had built before (See HERE) in which a Time Lord character (Ala Doctor Who-verse) was stranded on Earth and was using his intelligence to fight bad guys. I found a picture of a Dalek Hunter armor squad and that really cemented the notion that the Time Lords might use more war-like tactics if the situation required it. Thus, the idea that a Time Lord, stranded on Earth might use his advanced knowledge to build a suit of armor and fight the bad-guys. To avoid having to initiallly drag in a whole universe of characters, I opted to make the character of "alien origin" but did not call him a "Time Lord"... I can always bring that up later. Right now, he is merely an alien from a race with advanced tech. YES... I did borrow a lot from the Time Lords, but I avoided calling him one. What is in a name???? In the game, he has been hiding out and fight the bad guys. The team knows very little about him and this is the way he likes it. The suit employs the same design tech as the previous models with a few tweaks. I added a new Alt Power to the weapons system, A sonic-powered multi-tool. I really doubt I will ever make a T.A.R.D.I.S. (Time And Relative Dimensions In Space) for my Paladin character, but I have considered making the suit being able to open a portal to a "pocket dimension". The stranger part is that I even had the weird idea of having a real T.A.R.D.I.S. (as in "Blue Police Box)transforming into the suit. Follow my thinking... If you dare!! The hero runs into a blue box .... <insert sound effects> and instead of the blue box disappearing, it starts to shrink down and transform into a battlesuit. Which functions as a normal battle suit... HOWEVER... it can then transform back into a "Police Call Box" and then is "bigger on the inside than on the outside". Strange concept... but it could be fun. It is a weird thought... but it might be fun to try stat'ing out.... Or not. Here is my 3e version of the Centurions character that I built in 2e. After building them in 2e, I have been toying with the idea of converting them over. It is a matter of time.. The Centurion Project was brought into existance by global outcry. The United Nations wanted to create a peacekeeping force that did not rely on the "supers". Ordinary men and women would be trained and equiped with advanced combat systems that would allow them to operate in virtually any enviroment and at different levels of response. The project was dubbed... the Centurions. The entire idea started with the invention of a the Modular Combat Systems Exo-Frame. 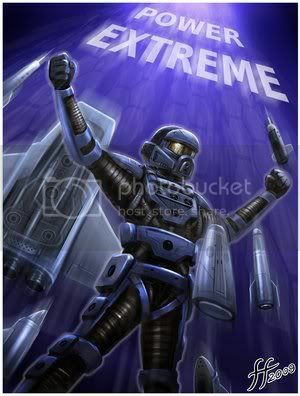 Professor Kane designed an exo-frame suit that granted the wearer enhanced strength and protection as well as allowing advanced combat systems to attach to them. The combat systems provide the power for the frame and the exo-frame adjusts the strength enhancement so that the wearer is able to handle the combat system as if it were not an encumberance. With the exo-frame and the use of a teleporter system. 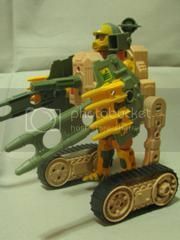 The Centurions could be sent anywhere in the world and given the weapons that they need to handle any situation. A large orbiting space station was placed into orbit, from which the operations of the Centurions could be monitored and the combat systems could be deployed. The space station, dubbed the Sky Vault, holds most of the weapons used by the Centurions. If there is a need for a combat system that is "out of stock" then the system is 'beamed' from secret warehouses elsewhere. Professor Kanes' daughter, Krystal was given the position of Systems Operator and commands Sky Vault One. Last edited by Emerald Flame on Mon Apr 25, 2011 2:09 pm, edited 1 time in total. Alright... I know that my interests are varied.. 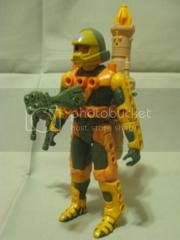 But just as I started to work on my Centurions conversions.. My kids got me looking at Power Rangers. The action is somewhat campy... Ok really campy and the acting won't win any awards.... But the Zords. ..
Ok.. I have always had an interest in robots and tech-heroes. I started wondering about about a hero with robot animal companions that could combine into a kickass battlesuit. The guy would be a pretty normal schmoe with some powerful pets. Here is the first weapons system that I stat'd out for 2e.. and accordinly the first for 3e. This is the standard weapon system deployed by Jake Rockwell (Land Operations). As previously, I opted to stat each item up on a line instead of lumping the weapons together in an array. I did not include the power amplification backpack (granting the exo-frames ability to handle the weapons) I figure that this is a role-play conept more than a roll-play item, so I opted to leave it out. Last edited by Emerald Flame on Sun Oct 28, 2012 1:13 pm, edited 3 times in total. Last edited by Emerald Flame on Sun Oct 28, 2012 1:14 pm, edited 3 times in total. Here is the cool armored motorcycle that Jake Rockwell used in the series. It did not carry many weapons, but it was a work-horse and could take a beating. Last edited by Emerald Flame on Sun Oct 28, 2012 1:17 pm, edited 3 times in total. 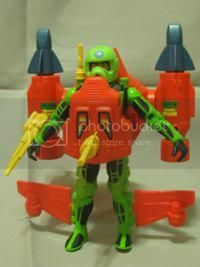 This was a late comer to the Centurions toy line and I remember seeing it in the store. I regret not picking it up at that time. It was on the discount rack. 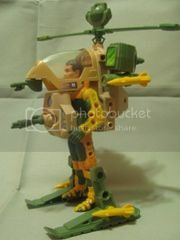 Although I do not remember this unit in the cartoon show, I always thought of it as a "replacement" or upgrade for Wild Weasel or a lesser version of Detonator. Last edited by Emerald Flame on Sun Oct 28, 2012 1:17 pm, edited 1 time in total. Last edited by Emerald Flame on Sun Oct 28, 2012 1:18 pm, edited 1 time in total. Here is the second step in the aquatic combat system ladder. This is the medium-response unit that was used most of the time. 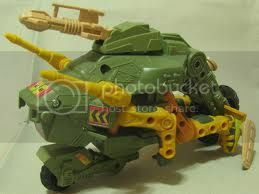 It granted the most flexibility and maneuverability while also offering higher levels of fire-power. This unit was a late-comer to the Centurions line. I remember seeing it on the toy store shelves. It appeared to be a rescue vehicle. It was able to burrow quickly through the ground and recover persons that might have been buried. Last edited by Emerald Flame on Sun Oct 28, 2012 1:21 pm, edited 1 time in total.